ex The Universal Code of Signals (Marryat, Richardson, 1864), here. the image — Grotesk-Tapete aus dem 1. Obergeschoß des Hinterhauses, um 1870.
ex Jürgen Beyer, Historische Papiertapeten in Weimar. Bad Homburg : Verlag Ausbildung + Wissen / Arbeitshefte des Thüringischen Landesamtes für Denkmalpflege 3 (1993). I love this book, much of it devoted to the walls in the houses of Goethe and Schiller. Stumbled upon in a library, now have my own. 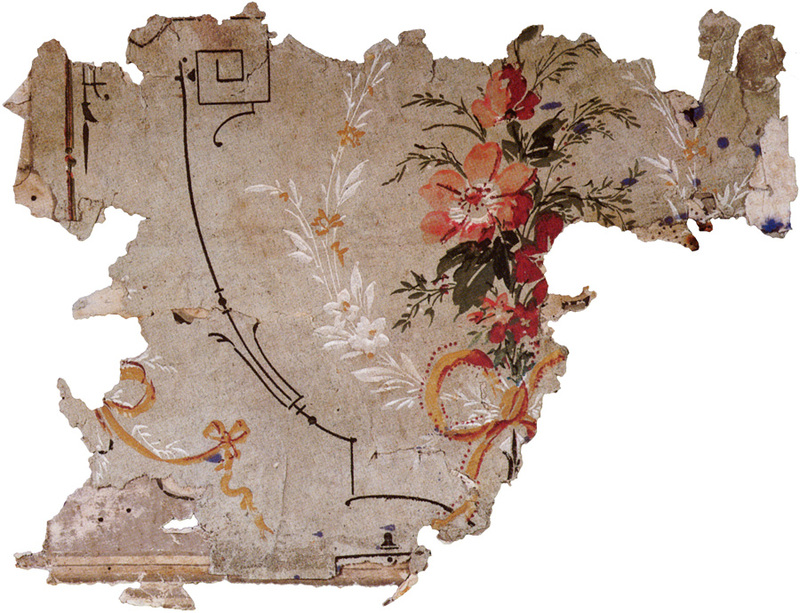 Palimpsestual wallpapers, each layer a witness to life lived. Fragments, though. The longer I live, the more irked I am to see man... [ who ] does the very opposite of what he wants, and then, because the undertaking as a whole is ruined, dabbles wretchedly in details. ex Goethe, Reflections in the Spirit of the Wanderers, in Wilhelm Meister's Journeyman Years or The Renunciants (Krishna Winston translation, Princeton UP, 1989), transcribed here .